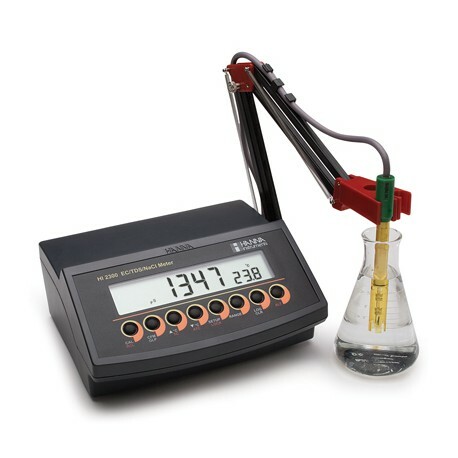 Autoranging; The EC and TDS scales are autoranging. The meter automatically sets the scale with the highest possible resolution. 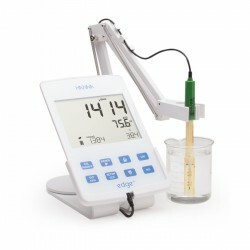 HI-2300 measures EC, TDS, NaCl and temperature. 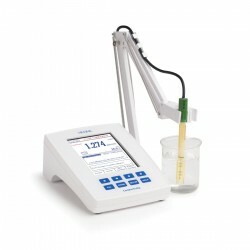 In conductivity and TDS ranges (up to 500 mS/cm and 400 g/L respectively) the instrument automatically chooses the best scale to maintain the highest accuracy. Manual (MTC): The temperature value, shown on the secondary LCD, can be manually set with the ARROW keys. The compensation is referenced at the selected temperature. All the other parameters of temperature compensation are settable similar to ATC. 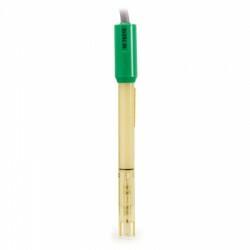 No Compensation (NoTC): For actual conductivity or TDS measurement, the temperature value shown on the secondary LCD is not taken into account. Cell constant is selectable between 0.5 and 1.700. TDS factor is selectable between 0.40 and 0.80. 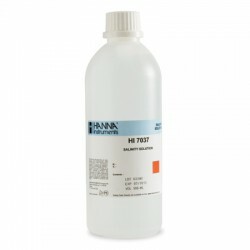 The HI2300 also provides users with GLP capabilities. Good Laboratory Practice (GLP) is a set of functions that allows storage and retrieval of data regarding the status of the system. 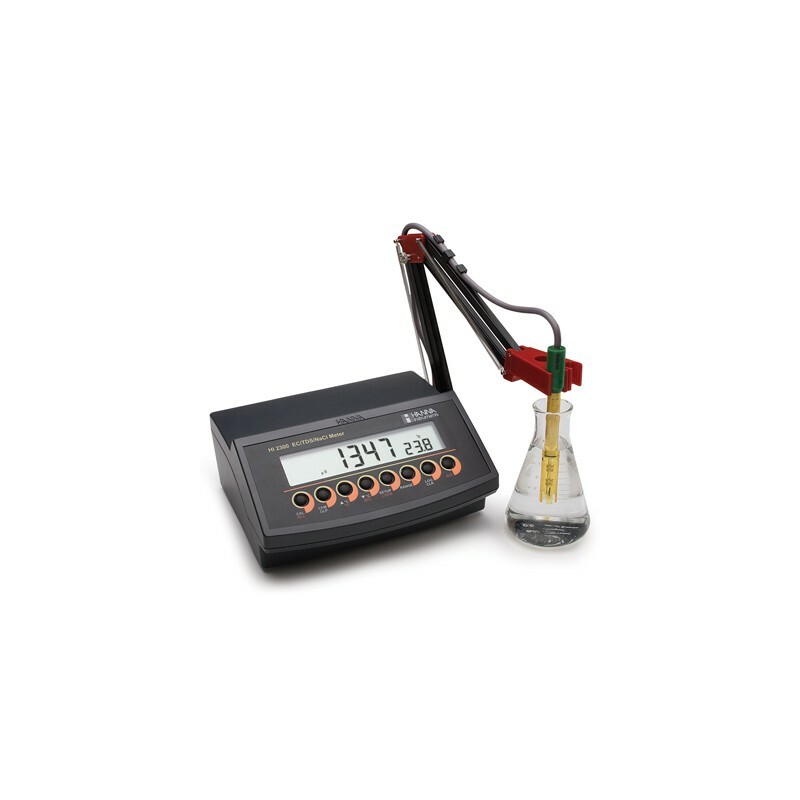 After a successful calibration, the meter automatically stores the date and time of calibration, the calibration solution used and the resulting cell constant value. All this information can be later recalled by the user. Other features include a lock range function and stability indicator. 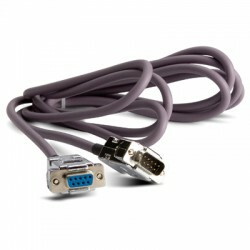 For PC communication, use the optional HI 92000 software and HI 920013 USB cable. The software is provided with an exclusive online guide of all the commands available and allows data printing, plotting and exporting. 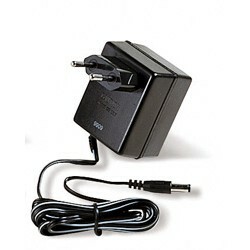 HI 2300-02 (230V) is supplied with HI 76310 conductivity probe, 12 VDC adapter and instructions.